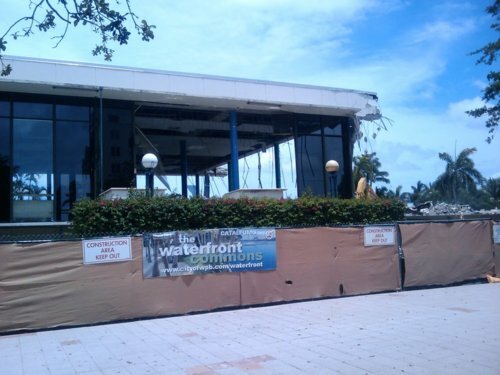 Today May 18th, 2009, the demolition of the old library began, "to uncork the bottle" and re-open Clematis Street to the water. 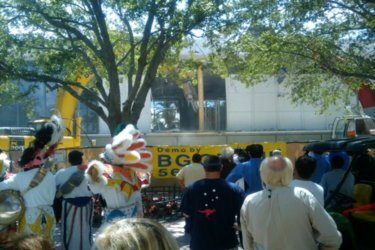 The City of West Palm Beach held a nice ceremony before the wrecking machines went to work. 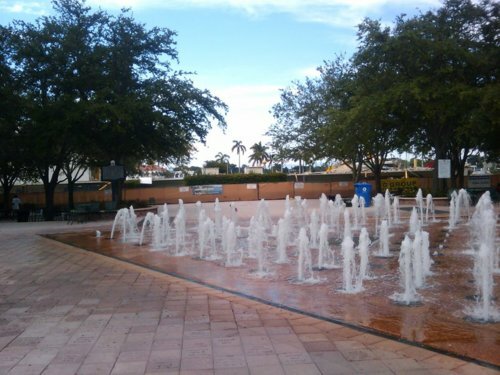 This big change was described as going "back to the future", since the entire area was a nice park open to the water in the early 1900's. The pictures below show you what actually happened today. 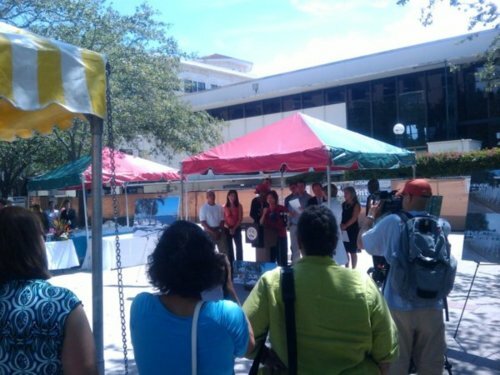 First, the ceremony (with the mayor speaking and four City Commissioners to the right side). 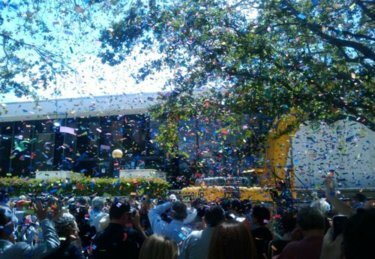 Then, the confetti. 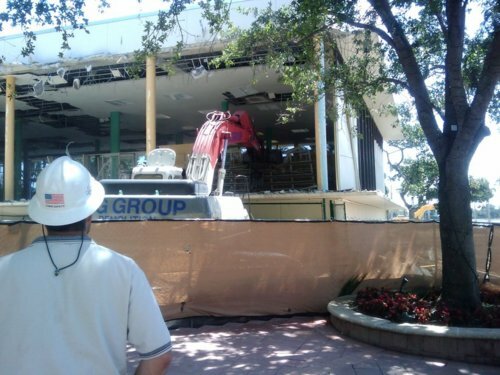 Then, the beginning of the end for the old library as the machines got to work tearing down the first wall. 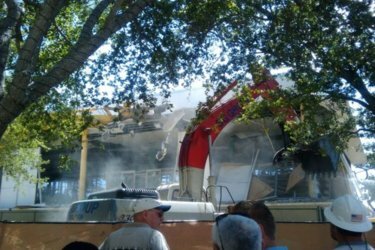 In the middle, you can see one of the machines reaching in and grabbing the library stacks and bringing them out onto the ground as rubble. The last picture shows what was left by the end of the day. 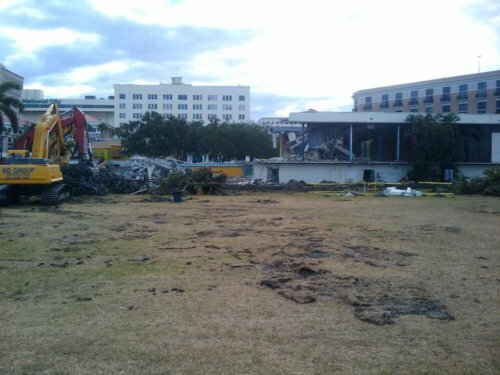 As you can see, part of the library was demolished, but a good 2/3rd of it remained standing. It turns out that the old library put up a tougher fight than expected, and will live to see another day (at least the remaining 2/3rd of it). So, we can't yet see what it will really look like when the library is gone. The work of demolishing the old library continued on Tuesday May 19th. 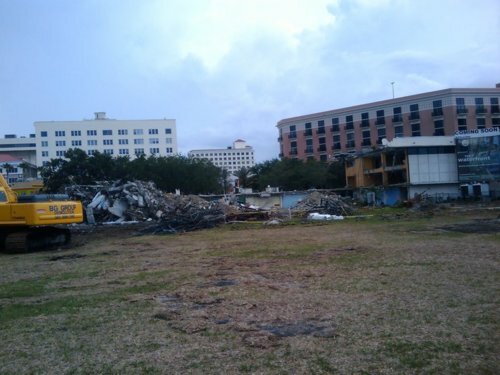 By the end of the day, the old library was almost half gone. 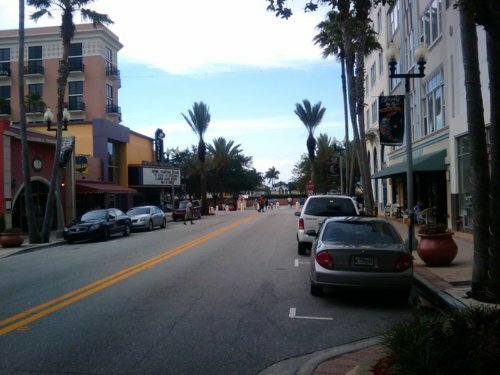 Below are some pictures -- first from the 100 block of Clematis Street (where the library still blocks the view of the water, but now you can see right through the middle of the library to the sky), then the latest view from the fountain area, and finally a view from the front near Flagler Drive. Another tidbit to note as the old library goes down. The restroom in the old library is of course no longer available since the building is being demolished. It was fenced off for good on Monday morning. Apparently, the homeless people that frequent this restroom and hang out in the area around the old library were shooed away by the City before the ceremony on Monday. The question is, did they return afterward? On Tuesday morning when I walked by on the way to work, I saw no homeless people in the area (whereas normally I see about ten of them sitting there). So far, there seems to be a difference. Have they found another place to hang out? I noticed a few this afternoon, so a few have returned. But it's no longer as convenient a permanent hangout for a homeless person, without the restroom (and due to the demolition/construction zone right there). Only time will tell. 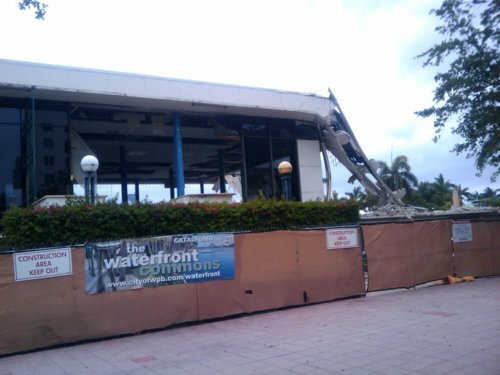 Below are four pictures which show the latest state of the old library demolition as of Monday May 25th, 2009. 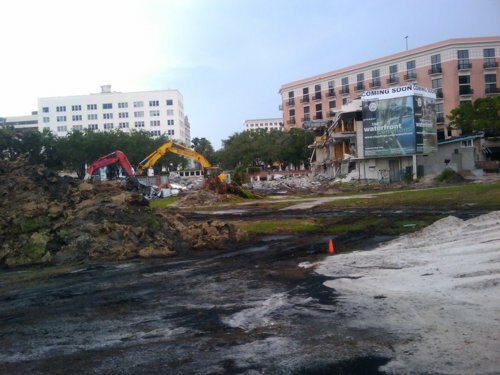 First, the view from the 100 block of Clematis Street, where you can no longer see any portion of the old library; instead, the arches of the Flagler Museum windows across the intracoastal on the island of Palm Beach are clearly visible. This is a distinct improvement over the plain white wall of the old library that was previously blocking this view. 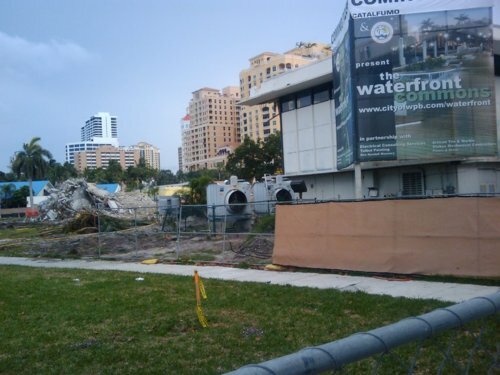 However, you still can't see the intracoastal waterway, since the basement and first few feet above ground of the old library is still there. We should actually be able to see the water once the 30-day demolition is complete, including the basement and the removal of all rubble. The second and third picture below, taken from the east side, show that the main floor of the library is now 5/6th gone, with only one small portion sticking up on the north side. The final picture shows the new view from the fountain area with the main floor of the library now gone. 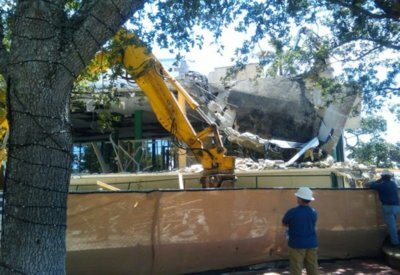 As of Saturday May 30th, there hasn't been much visible progress on the library demolition this week but I'm sure there has been progress underneath behind the scenes. They appear to be working on cleaning out all the debris from underneath the main structure of the library that was demolished the week before. However, they have left one small section of the old library 2nd floor (the northernmost section) still standing. It's really not a very pretty picture right now, looking from the waterfront (see below). Maybe that last small section should come down soon. Right now it looks like a war zone.